Took Malia aka Demon Spawn of Satan in to get her staples removed this morning. She was spayed last week. Oddly we all forgot she was supposed to be microchipped as well so we had that done this morning. This poor little puppy has been through the ringer the last couple of weeks. Luckily she is good natured and a bundle of energy so she just bounces back. She did however pee all over the table when the vet assistant gave her attention. She gets way too excited. We rarely have visitors these days so she is not socialized enough. I need to get her out and about after Christmas, buckle down on her training. After last weekend’s “I want to eat mini-me’s bf” incident, I really think we need puppy boot camp. Our last dog was so well behaved. I just need to devote my full attention to her for awhile and get her on track to puppy stardom. Okay so enough babbling and on to what you came here for. 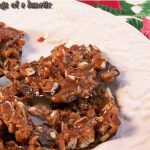 I found this great recipe on Baker’s Royale. Remember the whole “I thought I discovered Turtle Bark” episode. 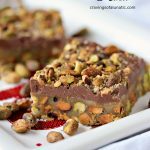 When I was searching all the other people who made Turtle Bark before me, I happened across this super cool recipe for Black Forest Bark on her site. Me being the Black Forest monger that I am I just had to try it. I tweaked a bit. Not sure how I feel about the results. Am thinking I should have stuck with the original on this one. She used dried cherries, I used candied cherries. Not sure but I think the moisture in them caused some issues with blooming. Still tastes awesome but Baker’s Royale’s version is much prettier than mine. This is what happens when your teenage daughter has her bf over for the first time and you are distracted by that and the fact that your puppy is trying to eat him, and is suddenly his best friend and wants to kill mini-me every time she laughs or smiles at him. Poor Kelvin. Kid may never come back. Place two pots on your stove part way filled with water. Bring them to a boil then turn them to simmer or just slightly above a simmer. Place your semi sweet chocolate in one bowl. Place your white chocolate in the other bowl. Now melt them, stirring with DIFFERENT spoons as they melt. Cut up your cherries into chunky pieces. Set aside. Once the white chocolate is melted add the red food colouring to make it pink. Now line an 8 x 8 pan with parchment and pour the semi sweet into the pan. Now haphazardly drop the pink in chunks here and there randomly. Now take a knife or toothpick and swirl it around a bit. Now toss your cherries on top. Pop this in the fridge to set for a couple of hours. Break apart by hand or cut with a knife. I have to admit I like the by hand method. I don’t like clean edges on bark. I like it to look like you just took a long piece of it and whacked it. Serve as gifts or eat it all up yourself. Enjoy! Pretty? Not so much. Delicious? Hellz to the Yah! This post is part of Christmaspalooza 2011! All I can say is YUM!! 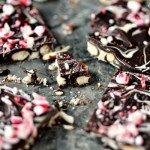 I already made some peppermint cookie bark, so I'm bookmarking this one for next year!!! @Cindy- Thanks. I still need to do peppermint. I did do peppermint ice cream though. Love the holidays. Thanks for coming by. Thanks for the nice comment. 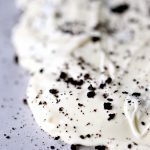 I'm afraid you caught my one and only recipe post. This, however, looks delicious and rich. I love chocolate and cherries together. Your ramblings on are hysterical, great stuff. I dunno, Kim! This looks really delicious as it is! I can understand the moisture concerns and the logic of dried cherries – but the candied cherries is SO festive! Delicious! I am thinking that yours is much more Christmas-y with the big huge RED cherries than a dried cherry confection would be. Dried cherries, though delicious, tend to be a bit nondescript, don'tcha think? So, if you make everyone look at the bark from a side angle, like in the photos, no one will notice any bloom. Just hold the plate above their heads and make them reach. It'll work. Really. awesome job here! HAVE A GREAT HOLIDAY!! oh my goodness, Kim! These look amazing! Love the candies cherries, way much better than the dried or maraschino ones! The bark looks super good. I love anything chewy, and those cherries look oh so chewy- yum. 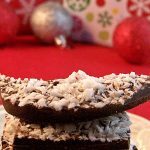 I would really love a piece of this right now with my coffee 🙂 I hope you're enjoying the holiday cooking as much as I am – looks like you are! Hey, are you a horse person? I noticed the pic on your SU page. I grew up riding so that caught my eye 🙂 I just posted a yummy soup, so come on over! What a lovely bark! I am a sucker for anything black forest as well. So yummy! @Dusty Coyote- Lol, that's okay. I like the site so I shall return even without recipes. Lol. And thank you so much. I do love to ramble. @Lizzy- Lol, it's called pepsi, by the truckload. I am telling ya this is the first time it bloomed. I blame hubs, I am sure it was his fault some how, some way! Lol. Tempering is a pain. I find if I buy the good stuff I don't need to. Think I got a bad batch. And thank you. I adore Christmas. I tend to be like Buddy the Elf on speed. @Janet- Lol, as long as your wiping and buzzing it's all good. @Curry and Comfort- Thanks so much. The kids rocked their classes and finals. Very proud of them. @Anne- You are so sweet. Thank you so much. Mini-me did really good. @Cheryl and Adam- Good to know she'll outgrow it. She is a growing concern. Puppy boot camp is imminent. Thanks so much for your kind words. I adore you guys! @Ann- Thanks my dear. I have to say this one tastes great. I love anything cherry related. @Tya- Aw, you are so sweet. Thank you so much. @Kristen- I cannot stop laughing. I could really have some fun with idea of holding it up over everyone's head. Lol! You are always so sweet. Thank you! @Claudia- Thank dear, you too! @Roxana- Thank you so much. Glad you like them. Happy Holidays to you too! @Sandra- I shall save you ten. How's that? Lol! @celiac- I swear this is quick for me. Lol! Thanks so much. @Marina- Thanks so much. I am having a blast. My waistline, not so much. And yes we are. We have a little arabian horse. She is a doll. I am working for a friend for the next few weeks who's out of town so we get to play with her arab, thor and friesan mix. Should be fun. I saw that soup and almost passed out. That snowflake is pure genius! @Beth Michelle- Thank you so much. I love black forest too. Hoping to do a wonderful recipe with it for Xmas if I have time. Hope you managed to get that tree up in the end. 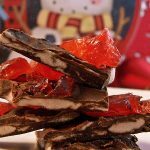 Loving that Christmas poolza and festive photos with the yummy bark flavours. I'm needing some of your energy, too, please – and make that snappy! 🙂 Happy holidays from Paris! Nom nom nom. I love the candied cherries on this bark! 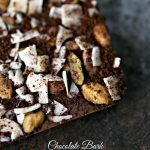 I love these bark recipes you have been sharing with us! This one looks really delicious with the cherries! I'm sure once you have your tree up, you will get into the Christmas spirit! Gotta tell ya, this looks pretty good to me! Distracted & everything. 🙂 Love the cherries on top. Yum!! On another note, my puppy used to pee anytime anyone would come over. He finally got over that, unless its my mom then he pees all over my stepdads shoes…kind of hilarious. I'm sure she'll come around. Congratulations on today's Top 9! This looks gorgeous! My husband LOVES Black Forest Cake… can't wait to make this and put it in his stocking. I'm thinking it will be perfect for Valentine's Day, too! Congratulations Kim on the Top 9!! Very nice….and just perfect for Christmas. Thank you so very much for sharing! Haha – I stay faaaar away from candied cherries! For some reason, as much as I love fresh ones, candied/pickled/whatevered cherries just don't work for me. Great color on your bark, though!